LAKELAND, Fla. - Matt Vierling continued to swing a hot bat in the series opener against the Lakeland Flying Tigers, but the Clearwater Threshers were held in check in the 8-3 loss on Monday night at Publix Field at Joker Marchant Stadium. Vierling picked up two more hits in the losing effort, but finished the night 2-for-4 with a double and an RBI. The product of Notre Dame is off to a .438 start at the dish, including three consecutive 2-for-4 performances. Clearwater (1-4) had an opportunity in the first to take the early lead, but the same struggles that hampered the team on Sunday afternoon continued into Monday night. After Simon Muzziotti singled to start the game, the young outfield stole second during Jake Scheiner's plate appearance. Scheiner, Vierling and Rodolfo Duran all flew out to leave the runner stranded. Lakeland (3-2) took advantage of its scoring opportunities with a five-run fifth against Andrew Brown (0-1) by collecting seven hits in the frame, three of which went for doubles. Brown had a chance to limit the damage in the inning after inducing consecutive groundouts after Brady Policelli's RBI two-bagger, but the right-hander surrendered an RBI double to Austin Athmann on a 1-2 pitch, an infield single to Luke Burch, a two-run double off the bat of Brock Deatherage, an infield single to Reynaldo Rivera, and an RBI knock from A.J. Simcox to complete the scoring in the third. The Threshers chipped away with a two-run fifth, but the Flying Tigers immediately responded with two of their own in the bottom half of the inning. Edgar Cabral launched his second home run of the season onto the berm in left in the eighth to cut the score to 7-3, but Lakeland would have yet another answer with a run in the home half. Clearwater finished the night 1-for-10 with runners in scoring position, and left eight men on base in the series opener. As the road team in 2019, the Philadelphia Phillies affiliate has gone 2-for-29 with a chance to drive home a run, compared to 7-for-20 as the home team. Dane Myers (1-0) earned his first win of the season for Lakeland. The Columbus, Texas native allowed two runs - one earned - on four hits, two walks and four strikeouts across five innings of work. 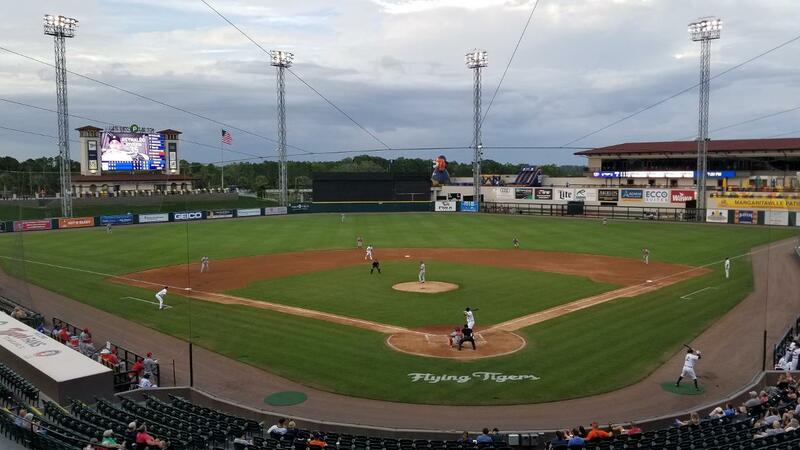 Clearwater will look to bounce back in game two of the four-game series against the Flying Tigers at Publix Field at Joker Marchant Stadium on Tuesday night. It has yet to be determined who will take the mound for the Threshers against the Flying Tigers' RHP Casey Mize (0-0, 0.00). First pitch is scheduled for 6:30 p.m., with coverage beginning at 6:15 p.m. on threshersbaseball.com.